Sports, nature and documentary cinematographers will salivate–here is a lens for 35mm format that could rival long 2/3″ format zooms. At IBC we heard Sue Gibson describing how she uses adapters to fit 2/3″ long lenses on her 35mm format digital cine cameras. It is lightweight, compact, and reaches out very far. Canon’s 50-1000 mm T5.0-8.9 zoom lens becomes a 75-1500 mm with its built-in 1.5x extender (giving it a 20x magnification). The 50-1000mm zoom lens has a removable servo drive unit, making it suitable for either broadcast-style or cinema-style production. Canon: What kind of lens would you like to see next? Jon Fauer: Can I dream? Canon: Yes, we are Canon. Jon: How about a 20-2000 mm zoom? Canon: Do you have any specific applications in mind for such a lens? Jon: Sports, cars, wildlife, commercials, features, action. The shot at the Olympics with the runner approaching. A remake of “Kagemusha.” A charging herd of buffalo. For wildlife photographers, how about 3000 mm on the long end? Jon: But as your cameras are more sensitive, it could be T5.6. Canon: To replace the 150-600 [still photo lens]? Jon: I owned one of your early 150-600 mm lenses, modified with a PL mount by Century Optics. It was huge and had a weird control that handled both zoom and focus, and wasn’t really a zoom. A new dream lens would zoom and be much smaller. So, I’ll see you next year at NAB with that lens? Canon: We’re not sure about the 20-2000 but we are on the same page—we are always trying to develop innovative, new products that are beneficial and special for creative people. Well, Canon was working very hard and very fast on such a lens. Image circle: 31.4mm — covers Super-35mm format sensors. EF- or PL-mount. Can be swapped at Canon Service Center. broadcast-standard 12-pin power connection for remote-control operation. The removable Servo/Digital Drive unit has a zoom rocker switch, programmable zoom and focus settings, and data connections for broadcast field/studio controls of zoom and focus. Removing the drive unit is simple and lets you use cinema-style lens motors. 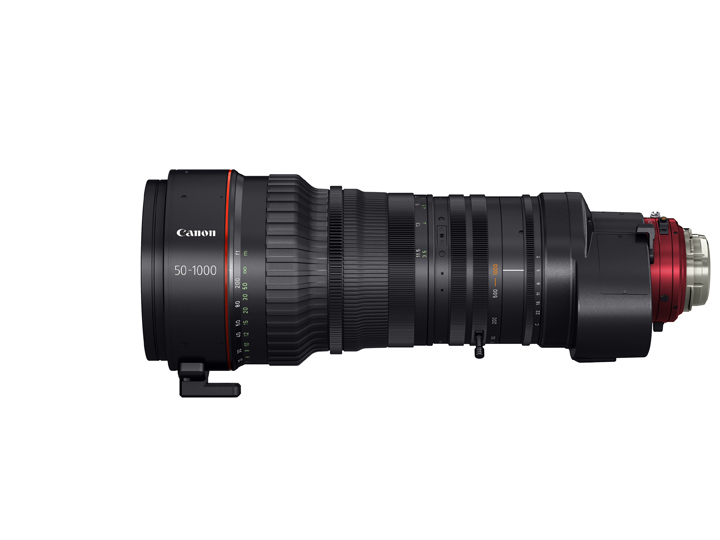 The Canon Cine-Servo 50-1000mm T5.0-8.9 zoom lens is compatible with industry-standard camera-to-lens communication protocolsfor most brands and models of 4K, UHD and HD cameras. These standards include 12-pin serial communication (common to major broadcast camera brands), Cooke /i Technology and Canon EOS-LENS data communication technology (used by the EOS C500, EOS-1D C, EOS C300 and EOS C100 Cinema cameras). With the Canon Cinema EOS system, lens data (including aperture setting) is displayed in the EOS camera’s viewfinder, and is recorded in the video file as metadata along with the model name of the lens and the lens focal-length. Broadcast-style features include servo control of focus, zoom, and iris. The removable Digital Drive unit has a 16-bit microprocessor encoder linked to the zoom/rocker switch. It zooms smoothly, without lag, covering the entire range from full-wide to full-telephoto in a quick 1.5 seconds up to a very slow 180 seconds. The encoder can transmit accurate analog and serial data for zoom, focus and iris settings through the Drive unit’s 20-pin connector. Operators can also manually control focus and iris settings from the drive unit or use it to program focus, zoom position/speed, and iris settings for precise, repeatable moves. A small LCD display on the drive unit displays current settings. Focus can be adjusted manually by rotating a knurled rubber collar on the lens. With its Digital Drive unit/hand grip removed, the Canon 50-1000 mm T5.0-8.9 Zoom lens offers a unique range of long focal lengths–going all the way to 1500 mm with the built-in 1.5x extender. Lens barrel marks are engraved in both feet and meters on both sides of the barrel, and focus marks on the front side of the lens are marked on an inclined surface to make them easy to see while operating the camera. Luminous paint is used for the scale display on one side of the barrel to help make the markings visible in the dark. Both 0.8 type and 0.5 type gear module focus accessories can be used, and gear positions support the use of a follow focus and all other standard electronic accessories. Canon Cinema EOS lenses are identified by their red alumite color near the mount. The EF mount can be replaced with a PL mount, or vice versa (electrical system included). This conversion can be provided at authorized Canon service centers. The EF and PL versions of the lens are designated CN20x50 IAS H/E1 and CN20x50 IAS H/P1, respectively. 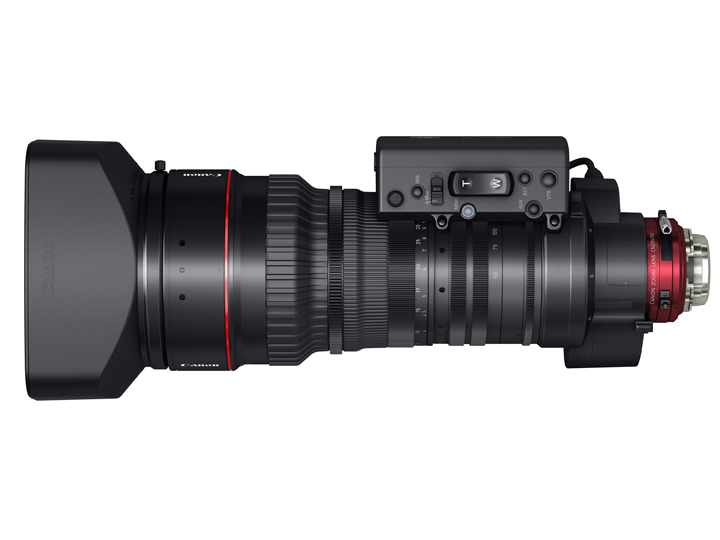 The new Canon Cine-Servo 50-1000mm T5.0-8.9 Ultra-Telephoto Zoom lens joins Canon’s Cine-Servo 17-120mm T2.95; CN-E 15.5-47mm T2.8 L and CN-E 30-105mm T2.8 L Compact Cinema Zoom lenses; CN-E30-300mm T2.95-3.7 L and CN-E14.5-60mm T2.6 L full-size Cinema zooms; and six Cinema prime lenses for single-sensor Super35mm production. Click on first image to begin slideshow.